Southern University at Baton Rouge (SUBR) is a four-year, state-supported, coed, liberal arts instit…. 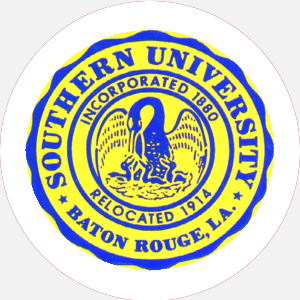 Southern University at Baton Rouge (SUBR) is a four-year, state-supported, coed, liberal arts institution founded in New Orleans in 1880. It was a result of legislation introduced by Pinckney Pinchback, the nation’s first black governor, and other black politicians to provide an institution for the education of persons of color. The former Hebrew girls’ school known as the Israel Sinai Temple Synagogue was originally purchased as the site for Southern University. When the school opened in 1881, 12 students were in attendance; presently more than 8,000 students attend. By 1886 the University had outgrown its facilities, and the state appropriated ,000 to purchase the square at Magazine and Soniat Streets. When an Agricultural and Mechanical Department was added in 1890, the school adopted its present name, and within a year the institution became a land-grant college under the Second Morrill Act. The school awarded its first bachelor’s degrees in 1912. The New Orleans site was closed in 1914, and later that year the Baton Rouge campus opened at Scotlandville. The New Orleans branch reopened in 1959, and the Shreveport branch opened in 1964. The three campuses make up the Southern University system, the only black public university system in the nation. Baton Rouge serves as the main campus. SUBR is part of the Strengthening Historically Black Colleges and Universities Program, designed to enhance the physical plants, academic resources, and student services of Historically Black Colleges and Universities (HBCU). As a land-grant institution, Southern University is committed to providing education to students with heterogeneous abilities and varying academic backgrounds. Its purpose is to prepare students to compete in their respective professions and to pursue advanced study in graduate and professional schools. SUBR consists of 156 buildings and occupies nearly 512 acres in addition to a 372-acre farm. The facilities are an architectural blend of old and modern buildings. Many recently constructed buildings have more than 2 million square feet of floor area. Among the more recently constructed buildings are the Clark Activity Center, J. S. Clark Administration Building, the Music Recital Center, the Cade Library, the School of Nursing, and the New Health Research Wing of Lee Hall. Southern University is accredited by the Southern Association of Colleges and Schools (SACS) to award the Associate of Arts, Associate of Science, Bachelor of Arts, Bachelor of Science, master’s, and doctoral degrees. Percentage of the student body receiving financial aid: 90 Financial Aid Specific to the School Air Force and Naval ROTC offer two-, three-, and four-year scholarships that pay tuition, fees, books, and other expenses and provide a monthly stipend. March 15 (priority); continuous notification. July 1 (fall); December 1 (spring); April 1 (summer). Graduation from an accredited high school (or equivalent) and completion of the following units: 4 English, 3 mathematics, 3 science, and 3 social science; highly recommended electives in foreign language, computer science, and visual and performing arts; official high school transcript with at least a 2.2 GPA. A nonrefundable application fee is required. Admission Application Deadline: July 1 (fall); December 1 (spring); April 1 (summer). Admission Contact: Director of Admissions, J. H. Harris Hall, PO Box 9901, Southern University, Harding Boulevard, Baton Rouge, Louisiana 70813; Telephone: 225-771-2430; 225-771-2500 (fax). A minimum of 124 semester hours and completion of core requirements, including the following hours: 6 English (composition), 6 mathematics, 6 social science, and 9 science; pass a 3-hour African-American experience course; complete at least 30 hours, one semester, and one summer in residence at SUBR; pass comprehensives in major and various core courses; pass writing proficiency test; and take general section of GRE or professional school entry test (LSAT, MSAT, etc.). Campus Regulations: Freshmen under 21 must live on campus. Campus Services: Health center, personal counseling, career counseling and placement, student employment, legal counseling, remediation, tutoring, and child care. Campus Activities: Campus activities include theater, concerts, jazz band, marching band, chorale, and dance. Students may get involved in the Southern University Digest (student-run newspaper) or the Jaguar (yearbook). Communication majors may work at the student-run radio or television station. Leadership opportunities are found in the Student Government Association or various other departmental clubs, such as the Aquatic Club, the Art Club, National Black Engineers, Jazz Club, and Lacumba Players. General clubs include NAACP, East Coast Connection, Muslim Association, Active Islamic Association, Malaysian Student Organization, Windy City Organization, and the Renaissance Organization, to name a few. Religious groups include the Newman Club and clubs representing Baptist, Interdenominational, United Methodist, and Church of God in Christ students. Greek sororities include Alpha Kappa Alpha, Delta Sigma Theta, Sigma Gamma Rho, and Zeta Phi Beta; fraternities include Alpha Phi Alpha, Kappa Alpha Psi, Omega Psi Phi, and Phi Beta Sigma; . Honors groups are represented on campus. The Association of Women Students and the Men’s Federation are resident hall support groups. These groups promote community living and provide Thanksgiving and Christmas baskets to city residents yearly. Housing Availability: 3,008 housing spaces; 1,000 freshman-only housing spaces; 2,008 upperclassman spaces; and 34 apartments for families. Associate Degrees: Electronic Engineering Technology, Jazz, Law Enforcement Bachelor of Arts: Elementary Education, English, Fine Arts, French, History, Mass Communications, Music, Music Education, Psychology, Spanish, Special Education, Sociology, Speech Communications, Theater Arts, Therapeutic Recreation and Leisure Studies Bachelor of Science: Accounting, Agricultural Science, Agricultural Economics, Biological Sciences, Chemical/Chemical Engineering Technology, Chemistry, Civil Engineering, Economics, Computer Science, Electrical Engineering, Electronic Engineering Technology, Family and Consumer Sciences, Management, Marketing, Mathematics, Mechanical Engineering, Physics, Secondary Education, Social Work, Speech Pathology and Audiology, Urban Forestry Master’s Degree: Biology, Chemistry, Computer Science, Criminal Justice, English, Environmental Sciences, Generalist, Health-Care Administration, History, Mass Communications (cooperative), Mathematics, Operation/Information Systems, Physics, Professional Accountancy, Public Policy, Mid-Career, Nursing, Public Policy/Analysis, Rehabilitation Counseling, Sociology, Special Education, Therapeutic Counseling, Therapeutic Education, Urban Forestry Doctorate: Environmental Molecular Toxicology, Material Science, Nursing, Special Education, Urban Forestry.